On December 8th and 11th 2012 Richard Chycoski posted two items to the H390-MTS e-mail group. Subject: [H390-MTS] MTS in my pocket! 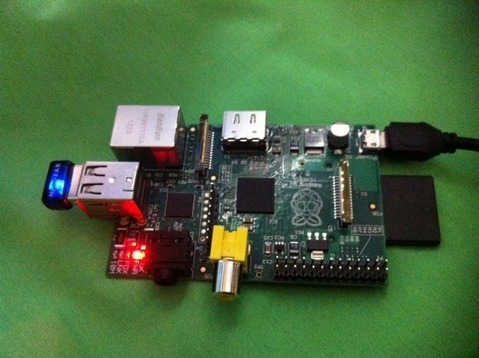 Using Hercules and the Raspbian release of Linux, I have MTS running on a Raspberry Pi: <http://www.raspberrypi.org/faqs>. It takes about 20 minutes to IPL and wait for the *NAL tasks to complete. I don't recall exactly how long MTS took to IPL on our first 370/148, but it was in the same ballpark (maybe ten minutes?). The Pi that I ran it on is also my household DNS/DHCP/IMAP/Sendmail server, but those processes were pretty quiet at the time. Top shows about 30% CPU when MTS is idle. Pretty cool! Any chance I can talk you into taking a photo or two? Subject: [H390-MTS] Re: MTS in my pocket! I copied my MTS/Hercules install to this Pi. It is plugged in to a wall-wart, I need to solder up a cable to power it from four AA cells. On an 8 GB SD card for 'disk', I have about 4.7 GB free. The Pi as seen here with all of it's attachments (SD memory card and WiFi dongle) is 2.5 x 5 inches in size. It idles at about 3.5 watts and maxes out at 5 watts. I'm getting a small video display to attach to the analog video output, and I have a wireless keyboard/trackpad to make for a complete, standalone system. When I get the whole thing together I'll send in another picture.